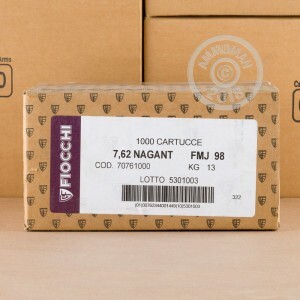 This new production 7.62 Nagant ammo from Fiocchi is a great complement to classic M1895 revolvers. 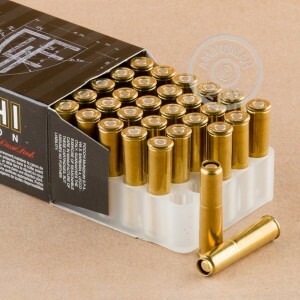 These cartridges come in a 50 round box and feature the 7.62 Nagant's tall brass case to produce the M1895's signature 'gas seal' effect. 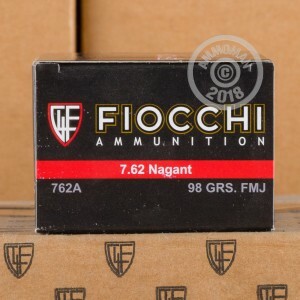 Manufactured in the US or Italy, these rounds use non-corrosive Boxer primers and reloadable brass cases and fire a 97 grain full metal jacket bullet. Thanks to the gas seal, muzzle velocity is a respectable 1,082 feet per second. Want to stock up on this hard to find ammo while it's available and save some money in the process? Place an order for $99 or more at AmmoMan.com and get free shipping!